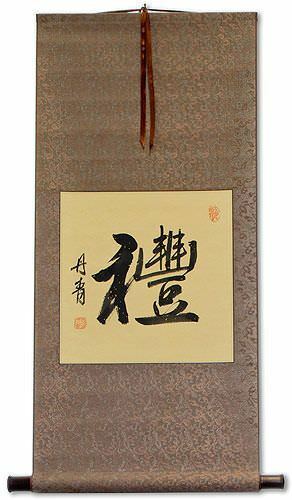 Buy a Respect Honor Esteem calligraphy wall scroll here! 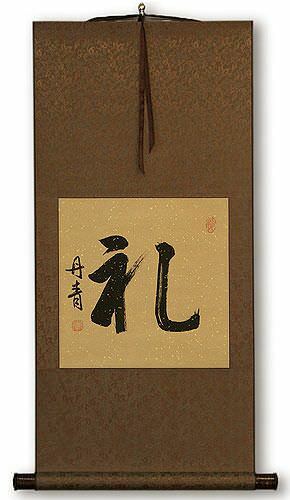 尊敬心 means respectful heart in Japanese, Chinese and Korean. 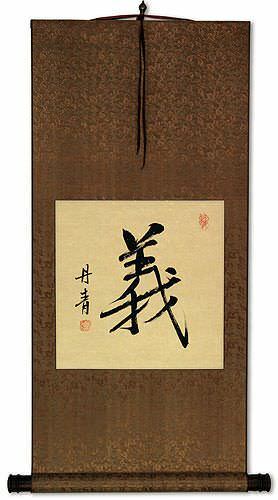 The root is 尊敬 which means respect, honor, reverence, esteem, and/or nobility. Therefore, you can also define this as honorable heart, reverent heart, noble heart, etc. In ancient times, it was thought your brain was the heart in your chest. Therefore, 心 or heart can also mean "mind". Hence, 尊敬心 can also be translated as respectful mind, honorable mind, etc. You'll see 尊敬心 romanized as Sonkeishin or Sonkeshin from Japanese. Not the results for respect honor esteem that you were looking for? Some people may refer to this entry as Respect Honor Esteem Kanji, Respect Honor Esteem Characters, Respect Honor Esteem in Mandarin Chinese, Respect Honor Esteem Characters, Respect Honor Esteem in Chinese Writing, Respect Honor Esteem in Japanese Writing, Respect Honor Esteem in Asian Writing, Respect Honor Esteem Ideograms, Chinese Respect Honor Esteem symbols, Respect Honor Esteem Hieroglyphics, Respect Honor Esteem Glyphs, Respect Honor Esteem in Chinese Letters, Respect Honor Esteem Hanzi, Respect Honor Esteem in Japanese Kanji, Respect Honor Esteem Pictograms, Respect Honor Esteem in the Chinese Written-Language, or Respect Honor Esteem in the Japanese Written-Language. 0 people have searched for Respect Honor Esteem in Chinese or Japanese in the past year.